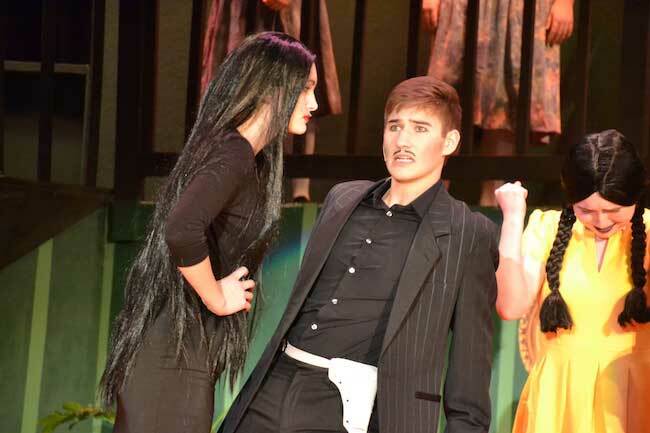 KENDALL – Ryan Barrett stars as Gomez and Olivia Reed is his wife Morticia in Kendall’s production of The Addams Family. Hanna Hofstra is their daughter, Wednesday. Morticia is upset that Wednesday is wearing a bright yellow dress, a break from the color black. Wednesday also is engaged, which further troubles her mother. Kendall will perform the show 7 p.m. today, and 2 p.m. and 7 p.m. on Saturday at Kendall Jr./Sr. High School Auditorium. 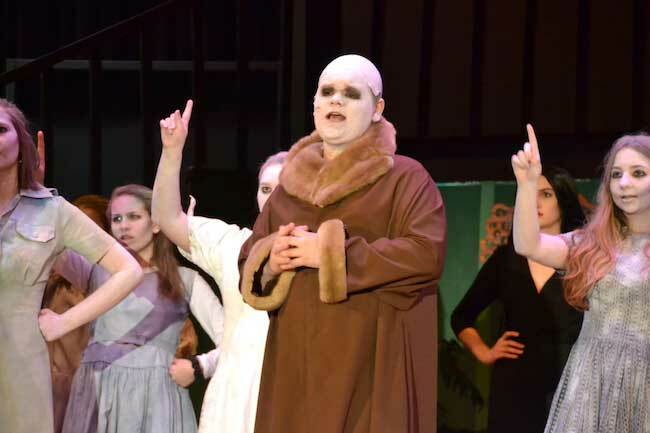 Kody Roese is Fester, who declares his love for the Moon. The Ancestors join this song. 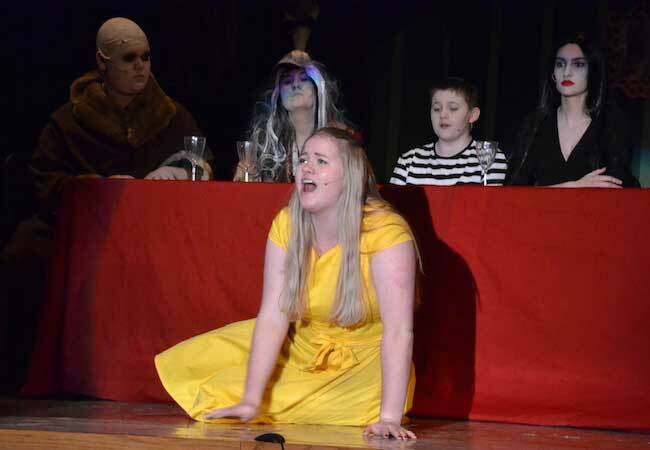 The drama department, Studio K, has been attempting more ambitious shows in recent years and The Addams Family is the most challenging so far, said Michael Billotti, the school’s drama director the past eight years. He also is an English teacher. Last year Kendall did Shrek the Musical, which was preceded by Once Upon a Mattress and Seussical the Musical. “We’ve building up to shows like this the last few years,” Billotti said. Several seniors have been with the program since seventh grade. Ryan Barrett, who plays Gomez, says the group has a strong bond and appreciates the program has been trying more difficult shows. 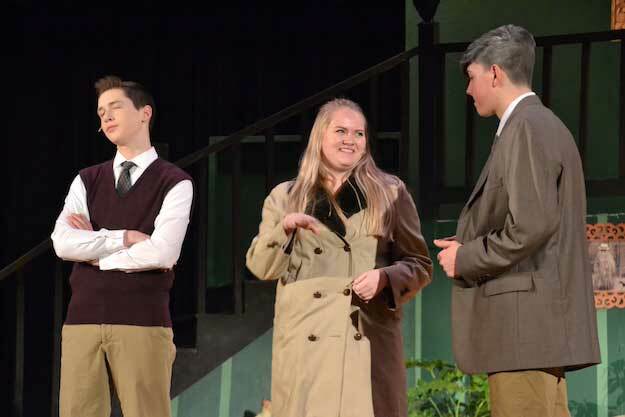 Hunter Menze, who portrays Lurch, also is a senior. 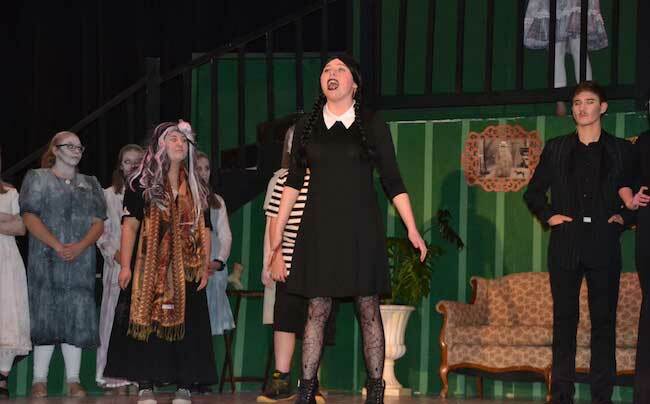 He said the cast was excited to to an edgy show like The Addams Family with lots of dark humor. “It definitely pushes the envelope,” he said. 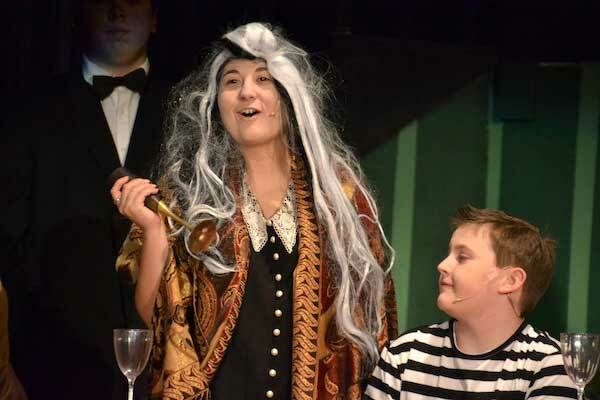 Sara Whalen is Grandma and Seth Pray is Pugsley, her grandson. Grandma is one of the more zany characters in the musical. The Beinekes head to the Addams’ family home for dinner. Joseph Nettles plays Lucas, left, who is in love with Wednesday. Anna Oakley is Lucas’s mother, Alice, and Brian Shaw is his father, Mal. Wednesday and Lucas urge their parents to just act normal for the dinner, but tensions mount between the families. Alice, Anna Oakley, accidentally drinks a potion resulting in brutal honesty and declares that her marriage is devoid of passion.